Buffalo firefighters try to douse flames from a blaze that engulfed this house at 1400 Fillmore Ave. and claimed one life just before 7 a.m. today. A child died in a pre-dawn fire at a house on Fillmore Avenue in Buffalo. 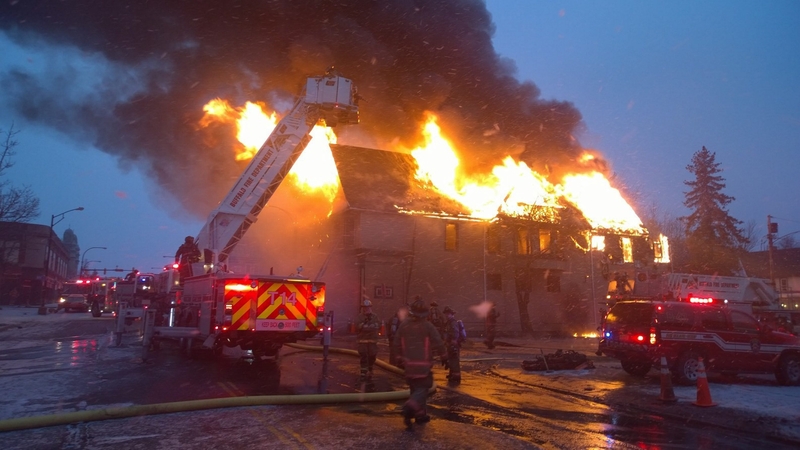 The fire at 1400 Fillmore, at Woeppel Street, was reported at 6:56 a.m., according to Buffalo fire dispatch. Firefighters were ordered out of the 2 1/2-story building at one point because of dangerous conditions inside. A victim was brought out of the building, a dispatcher said; further information wasn’t immediately available. Authorities would not immediately release any more information, but comments on the police scanner indicated the victim was 7 years old. Walter Griffin was reporting for work early Sunday at nearby Mattie’s Restaurant, where he’s a cook, and saw police and firefighters arriving at the scene. Other employees and customers at the popular Fillmore Avenue restaurant said they were aware that several children lived in the house; they had seen them at the school bus stop. It’s believed the family had been living there only a couple of months. “So sad,” said one restaurant patron, echoing the comments of others. Extensive fire damage is evident at the back of the building’s second floor. Only the front peaked wall of the attic remains. Damage was estimated at $80,000 to the building and $40,000 to its contents. Authorities had Fillmore blocked off from East Utica Street to Roeder Street this afternoon, with police cars stationed as far north as Winslow Avenue, as the investigation into the cause of the fire continued. At least one man was questioned in the back of a police car. The Red Cross was called to assist two adults and three children, the dispatcher said. The site of the fire is in a neighborhood with several vacant storefronts as well as some churches.